NAVAL, Biliran – The Department of Public Works and Highways (DPWH) Biliran District Engineering Office (BDEO) informs the general public that effective January 11, 2018 at 8:00 o’clock in the morning, Caraycaray Bridge is open to traffic. DPWH-BDEO clarifies that it will be opened to a 4-wheel type light vehicles only. He further informed that if PAGASA issues a Heavy rainfall warning, and the water rises, the bridge will become off limits to vehicles and pedestrians. 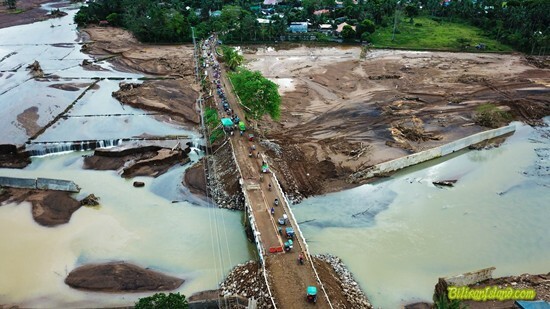 According to Bollido, total replacement is recommended for the Caraycaray Bridge, this, after both approaches were washed out by continuous heavy rains brought by Tropical Storm Urduja on December 15-16. DPWH-BDEO advised the travelling public especially the drivers, tricycles and motorcycle riders to take extra careful when crossing the bridge and to follow the traffic rules and regulations set by BDEO. It is the topmost priority of the district office to ensure the safety of the public. The Caray-Caray Bridge is an essential bridge because it is the only access in going to the Mainland of Leyte. 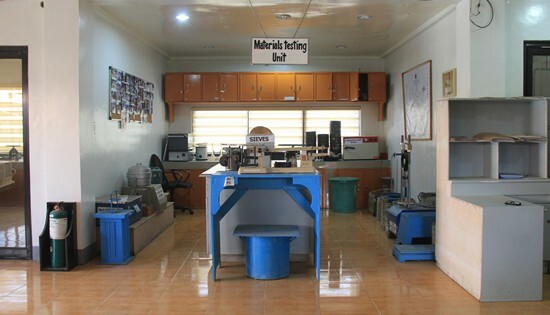 CALBAYOG CITY – DPWH Samar First District Engineering Office has sustained the one-star rating for its materials testing laboratory. The rating was issued last November 22, 2017 by the DPWH Bureau of Research and Standards as a result of the evaluation and assessment they have previously conducted on Samar First’s materials laboratory in accordance with Department Order No. 126, series of 2016. The star rating system classifies testing laboratories into One-Star, Two-Star and Three-Star categories based on the following criteria: availability of testing equipment and apparatus, competence/ accreditation of personnel, observance of health and safety standards, working area of the laboratory, calibration of apparatus/ equipment, and third-party certification. Engr. Angeles Villaseñor, assistant chief of the Materials Section, said that the rating is the manifestation of the collective hard work of the materials personnel, their Section Chief, Engr. Raquel Sumayo and District Engineer Alvin Ignacio. She added that the office is now in the process of acquiring new equipment and apparatus as well as encouraging their engineers to take the materials accreditation exam so that they can obtain the Two-Star rating. Incoming Department of the Interior and Local Government (DILG) Officer-in-Charge (OIC) Eduardo M. Año symbolically accepts the DILG leadership by accepting a DILG flag from outgoing DILG OIC Catalino S. Cuy during a turnover ceremony at DILG NAPOLCOM Center in Quezon City on January 09, 2018. QUEZON CITY – Incoming Department of the Interior and Local Government (DILG) Officer-in-Charge (OIC) Eduardo M. Año vows to be the "conductor who will lead towards a clear vision" while relentlessly waging a war against illegal drugs, corruption, communist insurgency, and violent extremism in the turnover ceremony held on Tuesday afternoon. Facing the officials and employees of DILG, OIC Año laid the blueprint of his leadership focusing on illegal drugs citing that "with the collective efforts of the employees and DILG-attached agencies, greater tasks will be accomplished in the service of President Rodrigo Roa Duterte's administration". "Under my watch, the DILG will relentlessly and resolutely wage a campaign to rid the country of illegal drugs, criminality, and corruption. The threats of communism and violent extremism will also be met head-on," says Año. "I will strongly uphold our primary mandate to 'promote peace and order, ensure public safety and further strengthen local government capability aimed towards the effective delivery of basic services to the citizenry'” he adds. To realize the said endeavor, Año says that existing local institutions that deal with peace and order and public safety such as the Peace and Order Councils (POCs), Anti-Drug Abuse Councils (ADAC), and People’s Law Enforcement Board (PLEB) shall be strengthened. He also says that the engagement of the citizens and other sectors of society in this effort or a whole-of-nation approach is essential to this crusade. The DILG OIC declares as well that under his leadership, ranks of local and police officials shall be "cleansed" to "separate the bad eggs from within the ranks". "As for local and police officials, and all engaged in crime groups, you will be held accountable and will be dealt with uncompromisingly for violating our laws,” says Año. According Año, being earmarked with 15% more budget compared to last year implies greater responsibility and accountability for the Department and higher expectations to produce relevant and solid programs and projects. "Local government accountability and performance is one indicator which will enable us to reach out to more Filipinos, ensuring that we are fulfilling our mandate. Thus, we will make certain that we strike a balance between our national and local government unit (LGU) driven initiatives," explains Año. Continued scaling of the performance meters that LGUs should meet such as Seal of Good Local Governance and Performance Challenge Fund, says Año, will be intensified to push LGUs to go beyond the demand of their job employing better service performance for the people. Año also promises to carry out needs and capacity building programs for LGUs for them to implement programs and projects that will address the needs of the constituents, especially in the fields of local economic development, social protection such as water, health facilities and other relevant projects. He also incites greater efforts for disaster preparedness saying that "such initiatives must start early on to protect the lives of our people and prevent tragedies brought about by typhoons 'Urduja' and 'Vinta' from happening again." "This is the only way for us to effectively perform our mandate. Magagampanan lamang natin ang ating katungkulan kung may sapat tayong kakayahan at kagamitan." Año also spoke of improving the internal governance capacity which includes the recruitment of new Police, Jail, and Fire Personnel and the necessary conduct of capacity enhancement activities. He says that such enhancement trainings will develop in them the values to become persons responsible for the protection of the people’s lives, procurement of necessary equipage, and construction of needed facilities. 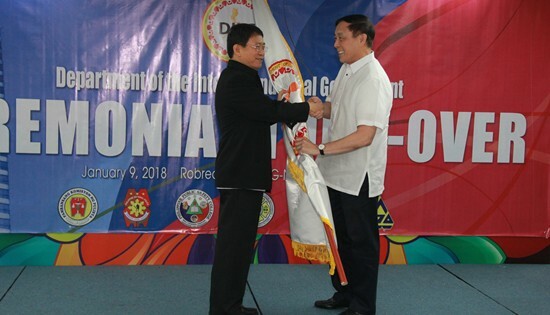 Año also acknowledged the steadfast leadership of outgoing DILG OIC Catalino S. Cuy saying that the turnover is about "brothers-in-arms accepting the greater challenge of leading their own teams of civil servants for a chance to better serve the Filipino public, and improve our communities and country." "Seven years of injustice to Ortega severed by release order to Reyes"
QUEZON CITY – "The seven long years of injustice to Dr. Gerry Ortega and his family is further severed by the release order of Palawan ex-governor Joel Reyes. The courts have become appendage to the culture of impunity in the country under Duterte." Thus said rights group Hustisya as they expressed indignation on the release of Reyes Friday afternoon, just weeks before the seventh year of the killing of the broadcaster and environmental activist. "We are saddened and enraged at the hasty release of Reyes. It took three years to arrest the Reyes brothers who went into hiding, and one day to simply junk all bases and evidences that point to them as the murderers of Ortega. We are one with the Ortega family in asking how has it come to this, wasting years that they have attained justice for the killing of Doc Gerry,” said Evangeline Hernandez, chairperson of Hustisya. Hustisya said it is gearing for actions to continue demanding justice for Ortega and other victims of extrajudicial killings under previous regimes and under Duterte. January 24 is the seventh year of the killing of Ortega. “It is appalling that while thousands more demand justice for victims of killings and rights violations under previous regimes, the Duterte regime, in turn, is acquitting and releasing those in jail,” said Hernandez. Hernandez explained that families of victims of killings want justice as much as the families of these few prominent cases, like that of Ortega. “For us, they might not be the murderers of our children, spouses, or kin, but they represent the thousands of killings that have not reached as far as putting the perpetrators to jail. If such a case as Ortega’s or Burgos’ cannot attain justice, what more the poor Filipinos who fall victim to killings, to abductions, and other violations?” explained Hernandez. The group appealed for support against the culture of impunity under the current regime. “We call for public support in the cause against impunity. This is the injustice and impunity that we should fight together. We attain justice in not letting the perpetrators escape accountability and public clamor to make them pay for their crimes,” said Hernandez. MANILA – The initial victory of the youth with the passage into law of Republic Act 10931 or the Universal Access to Quality Tertiary Education August of last year is continued to be spoiled by the still deceptive Implementing Rules and Regulations (IRR) for it will only aggravate the already inadequate and substandard quality of education of the youth. Just recently, Patricia Licuanan, chairperson of the Commission on Higher Education (ChEd), said that starting school year 2018–2019, tuition and other school fees of students in state universities and colleges (SUCs), as well as technical-vocational institutes (TVIs) would already be shouldered by the government. Licuanan later reverted that the IRR still does not guarantee that anyone could now be automatically admitted by any SUC. Also, it is the administration of SUCs who has the mandate on to whom the subsidy will be given with the repressive retention policy. The Universal Access to Quality Tertiary Education Act states that students with bachelor’s degree or comparable undergraduate degree from any higher education institution, and those who fail the SUC’s admission and retention policy cannot avail themselves of the free tuition. It is clear that the state is not serious in resolving the most basic problem confronting the youth. The law is only confusing the youth and giving false hopes in a mere palliative reform that does not constitute a fundamental change in the dominating policies on the current education system. In fact, these palliative reforms in the tertiary level are machineries for cheap and docile labor, especially under the K-12 program. With a laser point focus in the technical-vocational track, the state is equipping the country to senf millions of Filipinos to other countries. Neoliberal policies continue to be an encumbrance to the youth. Students suffer burdensome fees, annual fee increases, high costs of books and even high costs of the entire framework of student life. In addition, the futile financial assistance of the government only renders sure profits for private school owners. True enough, the state rampantly deprives the rights of the youth for quality and accessible education. Duterte has not done anything against the incessant tuition hikes. It is crystal clear that the bridges between the imperialist United States and the Philippines is wide open. Along with Licuanan, Duterte tightly embraces the neoliberal policies imposed by the US. The youth will remain keen for as long as the education system continues to be tormented by neoliberal policies. The College Editors Guild of the Philippines, as an alliance of tertiary level publications, joins the Filipino youth not only in their fight for a nationalist, scientific and mass-oriented education but also in the fight to resist and overthrow the fascist US-Duterte regime. Bangon Marawi: Marawi entrepreneurs receive loan assistance from SB Corp.
MAKATI CITY – At least 24 Maranao entrepreneurs received assistance from the Small Business Corporation (SB Corp) in form of the Pondo sa Pagbabagao at Pag-asenso (P3) loans to help bring back the business environment in the war-torn city. SB Corp, the micro-financing arm of the Department of Trade and Industry (DTI) released a total of P245,000 to 24 borrowers who were also recipient of DTI’s business starter kits. Another P10,000 P3 loan package was also released to 13 micro enterprises last week. “DTI is bringing the government's P3 microfinancing program closer to the entrepreneurs of Marawi by helping them start and rebuild their businesses. We are committed in reviving the vibrant business environment in the city, especially for the Maranaos who are well-known as traders,” said DTI Secretary Ramon Lopez. As part of Task Force Bangon Marawi (TFBM), DTI, together with other government agencies comprising the subcommittee on business and livelihood (SC-BL), has assisted affected Marawi residents to bring back the illustrious business city. DTI Undersecretary for Regional Operations Group Undersecretary Zenaida Maglaya assured that the agency has been on the ground to provide assistance to affected Marawi internally displaced persons (IDPs) to hasten the recovery and rehabilitation of the city. “Together with member agencies of the Task Force Bangon Marawi Subcommittee on Business and Livelihood, we would make sure that Marawi City will quickly return to normalcy upon the orders of the President. We’re bringing back business for our brothers and sisters who were greatly affected by the war,” Maglaya said. SB Corp has earmarked at least 1,000 Marawi entrepreneur beneficiaries that will receive loan packages in the first quarter of 2018. Maglaya added that more entrepreneurs will be assisted by the agency through loan packages without interest. The initial 37 borrowers were recipient of the DTI business starter kit from DTI Lanao del Norte and DTI Iligan City provincial offices. Succeeding loans will be done in cooperation with the local government and the administrator of the Marawi public market who shall identify qualified market stall owners as perspective borrowers. Other micro enterprises who are neither DTI starter kit recipients or Marawi public market stall owners, may apply for P3 loans from SB Corp accredited conduits such as Radiowealth Finance Company Inc. (RFC) and CARD, Inc. who are presently operating in the area. The provision of starter kits is in line with the order of President Rodrigo Duterte to provide livelihood to IDPs from Marawi City and other affected localities. This also follows the Administrative Order No. 03 of the President, mandating the creation of an inter-agency task force that would implement the recovery, reconstruction, and rehabilitation of Marawi City and other affected localities of which providing business and livelihood is crucial. Member agencies of the Subcommittee on Business and Livelihood are Department of Agriculture (DA), Department of Agrarian Reform (DAR), Department of Environment and Natural Resources (DENR), Department of Labor and Employment (DOLE), Department of Social Welfare and Development (DSWD), Department of Science and Technology (DOST), Mindanao Development Authority (MinDA), Office of the Presidential Adviser on the Peace Process (OPAPP), and Technical Education and Skills Development Authority (TESDA). The P3 program for Marawi will also provide credit risk support to microfinancing institutions (MFIs) including rural banks who want to start lending in the Lanao del Sur area in exchange for their timely and quick response. Loan qualification criteria will be relaxed to support gradual normalization of MFI operations in Lanao del Sur and nearby provinces where the displaced microenterprises were temporarily relocated. Interested microenterprise owners may contact SB Corp P3 Marawi coordinators at (088) 291-8033, 0975-906-2762, or 0916-662-0488. CAMP LUKBAN, Catbalogan City – Two communist terrorists (CTs) were killed after an hour of firefight with joint elements of Charlie Company and Scout Platoon of 78th Infantry (Warrior) Battalion, Philippine Army at Barangay Hilapnitan, Baybay City, Leyte at around 10:45 a.m. on January 4, 2018. In a report from Lt. Col. Danilo I. Dupiag, Commanding Officer of the 78IB stated that his troops acted on the earlier report by the residents of the barangay on the presence of an armed group conducting extortion activities at the said vicinity when they chanced upon more or less 18 communist terrorists. This resulted to the recovery of two dead bodies of the enemy, one M16 rifle, and one M653 rifle. Maj. Gen. Raul M. Farnacio AFP, Commander, 8ID lauded the troops for a job well-done and urged them to hunt NPA members harassing civilian communities thru armed threats and deceptions. To the communist terrorists, “armed struggle has only brought suffering, death and misery to our people, there are many ways to solve our problems and fighting is not one of the solutions,” Maj. Gen. Farnacio said. “Take advantage of the government’s integration program. It will provide you with an opportunity to return back to your families and communities and together we shall solve our problems the peaceful way,” Farnacio added.